Next to Normal Twitter performance. Wednesday 28th October 2009, Tribeca NY. 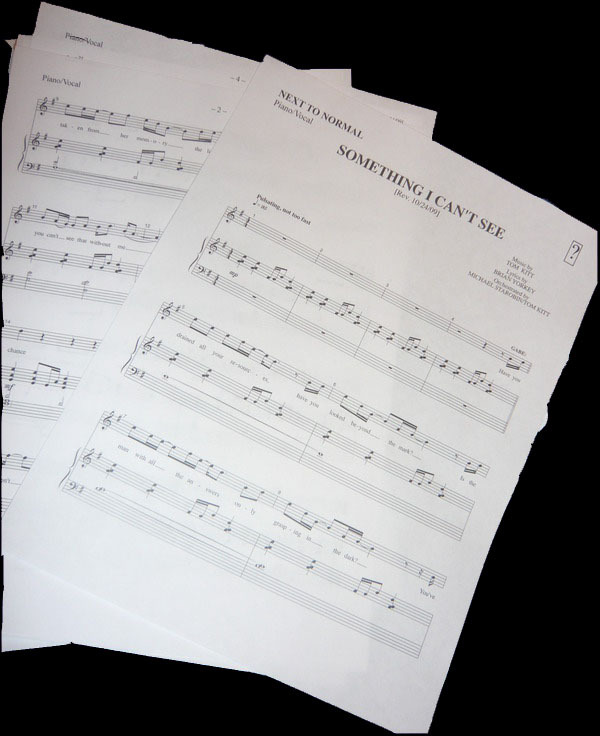 Starting Just before 12am gmt or 7pm US time Next to Normal on Twitter released their new song “Something I can’t see” to a unique audience. The audience being the twitter users who helped write this latest addition to the musical. In an intro video by creators Composer Tom Kitt and Lyricist Brian Yorkey welcomes tweeters to the event which was hosted live in Tribeca NY. The panel consisted of Tom Kitt (composer), Michael Greif (director), David Stone (producer) and Brian Yorkey (Lyricist). The panel talked about how the show was created and how it went from just being an idea in a BMI workshop to a tony award winning musical. There was also an explanation on how the new song “Something I can’t see” came to be written. During the process the twitter community voted on who should sing the song, where it would go in the show, what the motivations were and also the lyrics. Moments later questions from twitter users were answered by the cast. First Alice Ripley who plays the main part of Diana. Question? “Jesse from twitter wants to know how my interpretation of Diana has changed since the beginning”? Next up was Bobby Spencer who plays husband Dan. Question? “I have a question here from Eric he wants to know how I cope with the incredibly overwhelming emotions throughout the show”? Answer “Mmmm its a great question and I guess I never really think about it when I am doing the show. Dan just like comes organically it just comes with the job but when the show is done I get a little hot sockey for my throat because its pretty much an opera and its like when your in the gym working out with your muscles you like to take a hot bath, same when you sing a little hot sockey is good for the throat and other than that it’s just having fun throughout my day and laughing and being light hearted because an emotional show like this could tend to bring some people down but everyone in the cast is very very goofy, we are incredible goofballs. We all get along great and we are constantly laughing till they say places so thats how we cope with it by just being goofballs”. Finally Jenn Damiano who plays 16 year old Natalie answered questions. Answer “Mmmm I would say the single hardest scene or song to perform is definitely “Super boy and the invisible girl”. Mmm only because there’s a lot of emotion and anger going on during the song its still you know really hard to sing so it just takes a lot of balance and focus too because the worlds have so much weight on them and you don’t just want to through those phrases away because they seem so much and you still have to sign them pretty loud and really thoughtfully at the same time and its a challenge every night. But then the audience clap really loud after”. Finally the show is closed by a thank you video message from Tom and Brian followed by a link to a short preview of the song. The new song will be released soon as part of a podcast that is being created from last nights event. There are also plans for a future EP of songs that were cut from the show. For now Next to Normal is still running in the Booth Theatre in New York.